The Bitter Dissonance is a foray into painting images based on actual particular local dead trees that have caught my eye. In this sense there is a portrait element to the painting. The trees that have captured my attention are notable for their sculptural qualities and their nobility.The symbolism of death being apparent makes this work in essencea memento mori allegory. While sketching several trees i noted with curiosity abandoned shopping trolleys in the their vicinity, a coincidence too unusual to ignore. 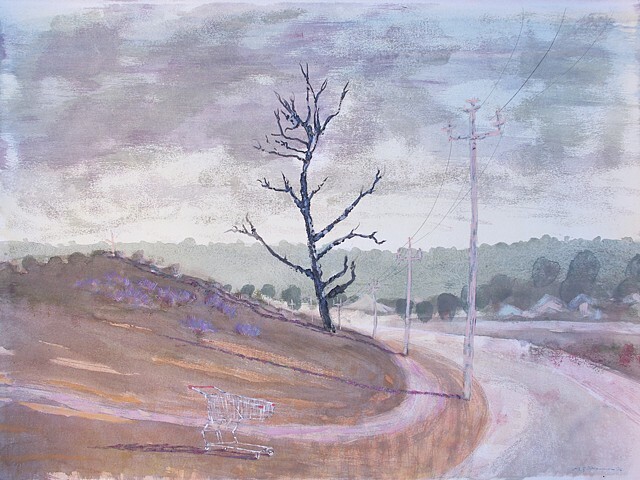 The trolley, itself an item loaded with myriad symbolic references from consumerism to homelessness, is thus included in this image to form the strange relationship between a tree and a trolley for our contemplation.